Reading time: 114 words, 1 page, 1 minute. This is the first time I’ve seen three typhoons (Pacific hurricanes) heading toward Japan at the same time: Chan-Hom, Nanka and Halola. The first has already rounded the south of Japan and is weakening into a tropical storm. 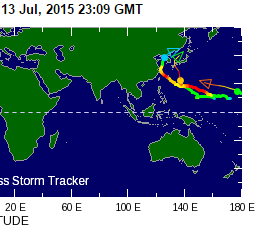 Nangka is headed straight for Japan as a Category 3 or 4. Prevailing Easterly winds could send it straight toward the stricken Fukushima complex. Halola, presently a tropical storm is forecast to become a Category 3 but the exact direction is not yet determined. I’ll continue monitoring the typhoons’ approach to Fukushima and issue another alert if necessary. This entry was posted in Nuclear Disaster Japan and tagged Fukushima, Japan, Pacific hurricanes, tropical storm, typhoons. Bookmark the permalink. Yes, and it’s accelerating in the dying Pacific Ocean. With the ever increasing levels of radioactive contamination, it’s estimated humans may be sterile in two or three generations (see the movie ‘Children of Men’). And, if that doesn’t do it, consider this. Humans now make up a third of land vertebrates measured by mass, and the animals that we keep to eat; cows, pigs, sheep, etc. – make up most of the other two thirds. All the wild animals are now less than 5% by mass. BTW – the last two Typhoons Nanka and Halola did not cause any structural damage at Fukushima but 500 MM of rain washed tons more radioactive contamination into the Pacific, as if we needed that.